A confidant of President Moon Jae-in was found guilty Wednesday of involvement in a massive rigging of comments on Internet news articles aimed at swaying public opinion in favor of Moon ahead of the 2017 presidential election. 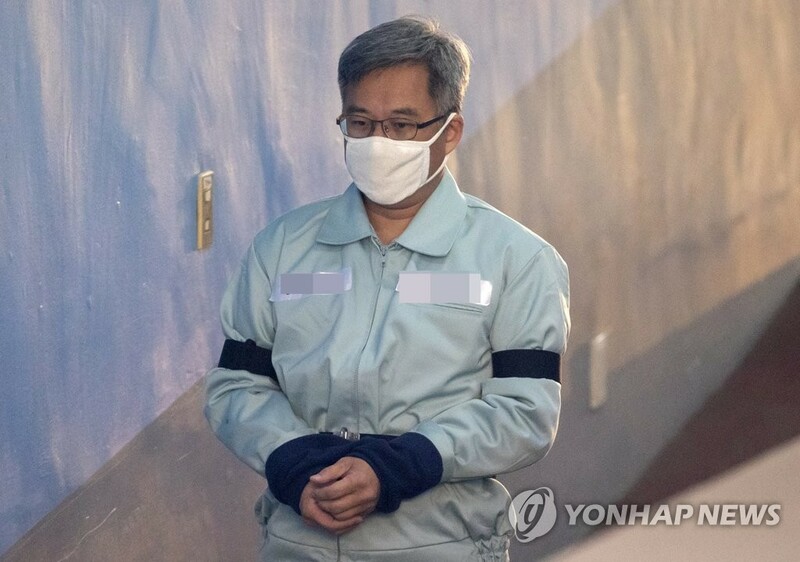 The Seoul Central District Court sentenced South Gyeongsang Province Gov. Kim Kyoung-soo to two years in prison for colluding with a power blogger to carry out the illicit cyber operation. The court also added another 10 months of incarceration for Kim, for violating the political fund law, but suspended the sentence for two years. The governor was immediately taken into custody following the court ruling. Kim’s lawyer said he will appeal. If convicted by the Supreme Court, Kim will lose his governorship. The 51-year-old politician was indicted for working with Kim Dong-won, a blogger better known by the nickname Druking, to artificially jack up the number of “likes” on Internet political comments to boost positive public sentiment for Moon, then presidential frontrunner of the then main opposition Democratic Party (DP). Wednesday’s court ruling could deal a heavy political blow to the Moon government as the judiciary publicly acknowledged that the governor “benefitted” from Druking’s scheme that eventually helped create positive public sentiment toward the DP and Moon during the election campaign. Moon won the snap election in May 2017, which came after his predecessor, Park Geun-hye, was ousted from office by the Constitutional Court over an influence-peddling scandal. The same bench sentenced the blogger, Kim, to 3 1/2 years in prison in a separate trial held earlier in the day, suspending an additional six-month jail term for one year for violating the political fund law. The court ruled that Gov. Kim, who is affiliated with the DP, was deeply involved in the rigging project, from devising ways to do it to actually carrying it out. It found that the governor had watched a demonstration by the blogger’s crew of a prototype designed to increase the number of “likes” on comments to tens of thousands from a few hundred. Kim was regularly briefed by Druking on its progress and gave his team the final go-ahead for the operation, an indication that the governor had thorough understanding of the entire scheme and its potential consequences, the court ruled. The court found that the blogger Kim masterminded the illegal cyber operation for his personal gain and that his operation provided substantial assistance to the DP in its election campaign. A special counsel was launched in June last year to investigate the allegations. It demanded five years in prison for the governor and seven years for the blogger. The court also found the governor of violating the election law by attempting to procure a consul general job in Japan for an associate of Druking in return for carrying out the illicit cyber operations. Gov. Kim has denied the charges. The scandal became a hot-button political issue in South Korea as it implicated two influential politicians — Gov. Kim and late liberal lawmaker Roh Hoe-chan. Roh jumped to his death in July last year amid the special counsel’s probe into an allegation that he took political funds from an aide to Druking. The presidential office Cheong Wa Dae issued a short message saying it will wait for the court’s final judgment. “It is a ruling that we had not expected at all. We will calmly watch (the situation) until the final verdict comes out,” presidential spokesman Kim Eui-kyeom said. Kim added that Moon made no specific comment on the result after being briefed on the ruling by his chief of staff. The ruling DP, meanwhile, expressed strong regret over the court’s decision, calling it the worst ruling that hampers public trust in the judiciary. “The court handed down the worst ruling in a way that damages confidence in the judiciary in order to reach a pre-determined conclusion,” Rep. Lee Jae-jung, a spokesperson for the DP, said. “We are confident that Kim’s innocence will be proved and that he will be found not guilty through trial,” she added. 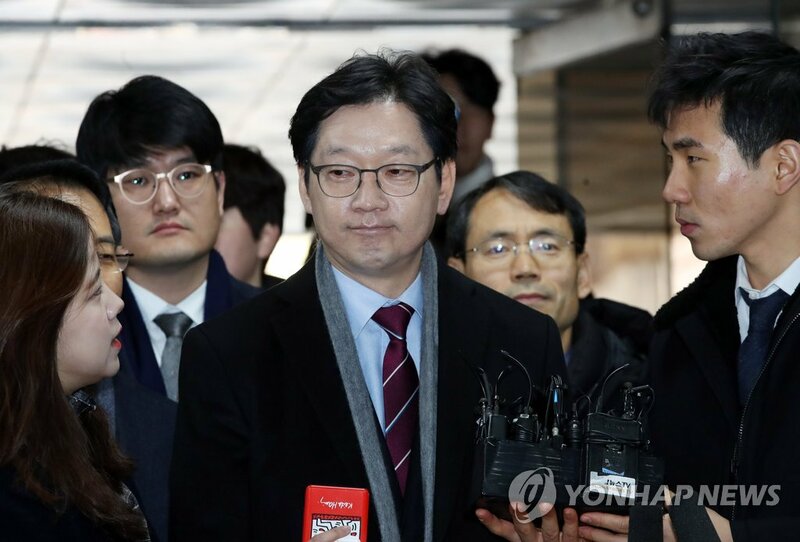 The party denounced the ruling as a politically-charged decision, saying that a judge over Kim’s case previously worked for a former Supreme Court chief justice who is currently in detention over a power abuse scandal. Former Supreme Court Chief Justice Yang Sung-tae was arrested last week on charges that he abused his authority to use trials as a political tool to lobby the previous conservative government.